The International Space Station (ISS) is a multinational research vessel that is currently orbiting at an altitude of 210 miles (340 kilometers) above Earth’s surface. The ISS project grew out of an agreement between the governments of the United States and Russia, who both wanted to build a permanent human presence in space but lacked the political will and funding to do so separately. With the breakup of the Soviet Union and end of the Cold War in 1991, civilian space projects took a backseat to other funding priorities for both superpowers; this meant that the Americans’ Freedom and the Russians’ Mir 2 space station programs were at a near-standstill. 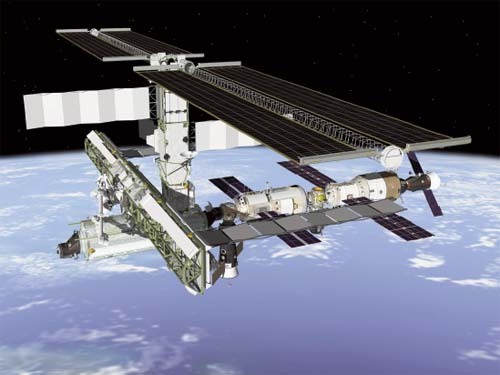 In 1993 an agreement was reached to build a new, fully international space station to be completed by 2010, a plan that was ultimately palatable to the voters and taxpayers of both nations. Today, the ISS is a joint project of the space agencies of Russia, Europe, Canada, Japan, Brazil, Italy, and the United States. The first ISS module was launched on November 20, 1998, by a Russian Proton rocket; the second module, called “Node 1,” was brought into orbit by the space shuttle Endeavour. Construction of ISS is now complete, although more modules and additions can be added in the future. It contains more than thirty-two thousand cubic feet (nine hundred cubic meters) of interior space, fourteen thousand of which is habitable. Including its solar panels, ISS is slightly longer and wider than a football field, and has a mass of more than 450 tons.